When I was a kid, my siblings and I ate huge breakfast at 5am because we wouldn’t be able to eat again until 3pm. We did have recess at school, but it’s about 15 minutes and we HATE eating in a rush. Sometimes the food goes down the wrong pipe. My grandma would cook us either fried rice or steamed buns or fried noodles (typical Chinese leftover-turn-into-breakfast). When she was feeling adventurous, we might find pizza (for breakfast? Why not?) or French toast (I say adventurous, because in my Chinese family, we almost never eat French toast at home) or donuts. But breakfast item I love the best is jook. My grandma would spread out small plates with strips of fried wonton skins, salted duck eggs, preserved eggs, chopped green onions, fried peanuts, fresh sliced ginger, salted fish and chicken blood. We can put whatever we want into our bowl of jook. I like to add a little of each at a time instead of mixing it all together at once, so I can savor each different taste. Whenever I make it nowadays, as I’m prepping the toppings, it always brings me back to childhood. It never fails to trigger fond memories, and sometimes they’re not even jook-related. In my head, they pop out like those bubbles in comic books. Ironically, I also associate my favorite breakfast item with sickness. Whenever we were sick, my mom would cook us jook, but without the luxury of various toppings. Just plain, not even with a hint of salt. Talking about moms…. Mine is going back to Indonesia tonight. She’s been staying here with us since September, to welcome her granddaughter in October 2010. And now she gotta leave, and I’m going to miss her. Back to topic, what’s your favorite breakfast item? This entry was posted in Breakfast, In my kitchen, Rice. Bookmark the permalink. Thank you for sharing your childhood memories with us. Such a comforting dish from you sweet grandmother. I've never had preserved eggs, I have so much to learn from other cultures. You are so sweet to post your childhood breakfast favorite. @Elisabeth: happy New Year too! 🙂 You should try preserved eggs, but my husband said it's an acquired taste. Hi Christine, found your site through Life as a Foodie. 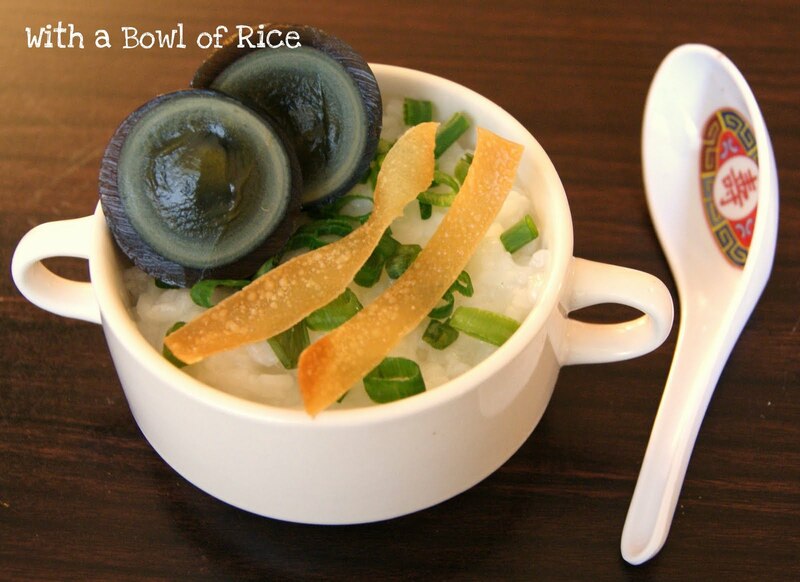 I love preserved egg/century egg!